Alchemy is hands down the most profitable profession in BDO. You can reach up to 30M/hour doing it. But unlike everything I've shown here, it's not at all AFK. Actually you spend your time running up and down, juggling with materials and looking up recipes, interrupted only by short crafting sessions. The reason why alchemy is so crazy profitable is exactly that it needs grinding, brain, pearls and initial investment. Those who are ok with brain and initial investment go cook. Those who are OK with brain and pearls go process. Those who are OK with grinding go Sausans. Very few people are OK with all of it. I did it big time back when I was new to the game, now I only create one item. Brain: most alchemy recipes have 4-5 materials and many of them are alchemy products of more materials which can be also products of alchemy. It is common that one item has a dozen original materials. You must have tables and charts to keep all your production needs tracked, or you end up with a bunch of materials and no way to craft because the marketplace just run off Sheep's blood and you have no stockpile. Grind: alchemy products aren't selling in millions a day. Crystals sell a couple hundred a day. Sure, their individual price is high (2-300K per piece), but you can't just craft a thousand AFK and list them. You craft a few, list them, craft something else, craft missing intermediates, drop everything and run to the marketplace when a rare material is listed and so on. 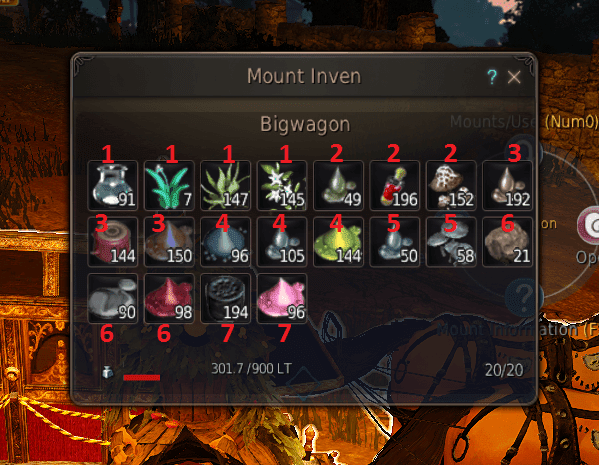 Keep in mind that crystals don't stack and you can list 30 items at once. So it's constant juggling with what you craft, where you store it and so on. Pearls: due to not stacking, multiple items and high amount of materials, you need lots of storage. That means lots of slot expansions, both for your avatar and your headquarters warehouse. Sure, the latter can be done by renting storehouses from CP (sacrificing AFK income), but character slots are expensive, 1450 pearls for 16 slots. Having a box in your residence is mandatory to save at least the runs to the warehouse. And it's still not enough, you need stables extensions for your various carts holding even more stockpiles. 1x Magic Crystal of Crimson Flame - Power: simple green crystal. Usually available on the marketplace for 6-8K. When not, the NPC Dora Fonti sells it in Heidel for 30K in infinite number. 1x Random gemstone. Practically any gem you find on the market for 6K will do. The total material cost is 84K, so you can pull about 150K on each after tax. As I only craft this one item, I don't need to juggle with materials, I just use my backpack and have some reserve fruit and blood for rainy days. If you are up to the challenge and don't bother spending hours running up and down, moving materials between various places and have a bunch of charts all over your desk, alchemy will make you very rich very fast. Otherwise, stay away! Remember, if you make 150K per crystal, you have to craft and sell 200 per hour to have 30M/hour! Even though your guides are great, I do have to mention the selling of 200 crystals an hour. As you said, the maximum number of items you can have on the marketplace at once is 30. Since the time for items to pop up on the market place is 10 to 15 minutes, after putting them on, the maximum amount of items sold is 120-180/h. This is when the items are sold instantly (excluding pre-order sells). So the 30m/h is a bit overexaggerated. If you could make 15-20m/h, by just making these crystals, you are already VERY lucky. Not to mention that at some point the demand will be decreasing, due to flooding. Where did I say that you can make 30M/hour from blue crystals? I make one crystal because it's simple and has high silver/effort ratio. You can make 30M/hour if you go crazy and craft all kind of alchemy materials that people buy when there shortage like essences (they stack) and alchemy stones. Crafting these is mostly getting the materials which are permanently missing from the AH by watchlisting and camping the marketplace. "The total material cost is 84K, so you can pull about 150K on each after tax. Remember, if you make 150K per crystal, you have to craft and sell 200 per hour to have 30M/hour!" That's called a "hyperbole", pointing out that it's impossible to make that money with a simple and pleasant crystal factory. Hey I'm kind of new to the game so I don't understand how you're going from doing those quests to suddenly making a lot of silver. Just from that crystal? 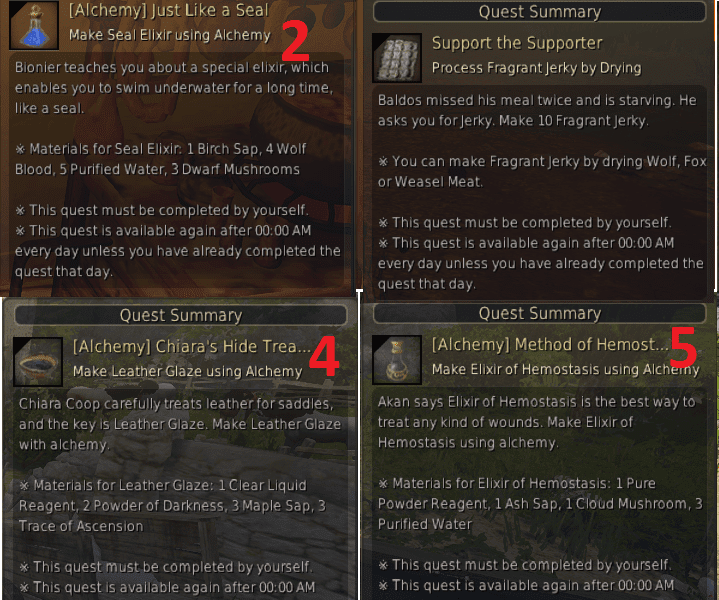 The quests give you alchemy skill. You need the skill to do all kind of stuff. Hey Gevlon I have been doing a lot of alchemy lately and shining powder has begun to stack up. How do I go about making money with them? 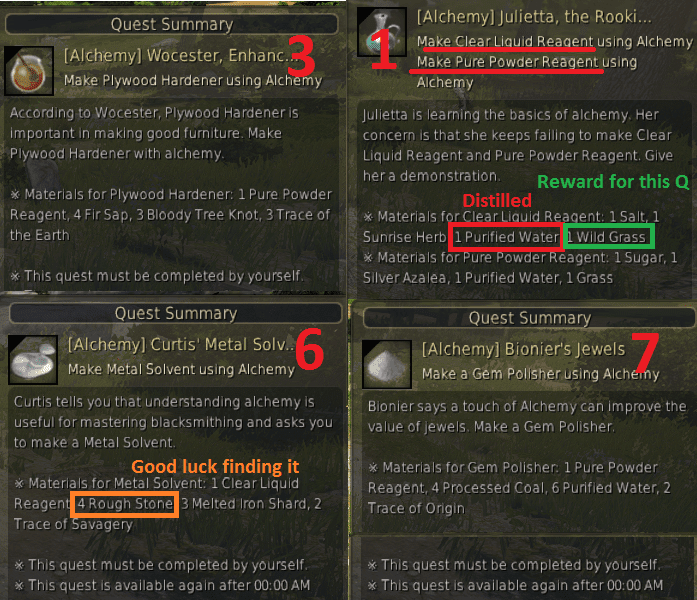 Which alchemy stone is worth getting and should I be upgrading them before selling? Can you give some examples of the type of items you would craft to make 30 mil an hour? Could you list the items in the Olvia cart I should bring? Thanks!